Hei, oikein mukavaa sunnuntaipäivää! Tervetuloa marraskuun Penny Black and More haasteen pariin. Jouluisia leimattuja kortteja halutaan nähdä haasteessamme kuukauden ajan. Tämä lintu on PB: n uusia joululeimasimia, tein kaksi samantyyppistä korttia kerralla. Hello, first Sunday of the month - it's time for new Penny Black and More November Challenge. Our theme is "Anything Christmas with stamping"! And you can use any stamps, but no digis! Fabulous prizes comes from these sponsors: Penny Black, Crafts U Love, Crafts Ribbons. 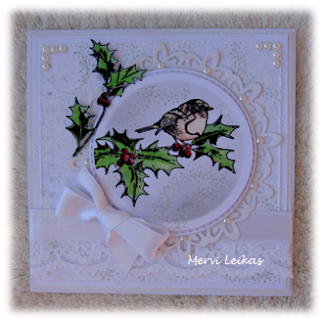 I made two cards with new Penny Black stamp "holly tweet 40-405". I fussy cut one branch to the left side. Colouring with ProMarkers, diecuts Spellbinders, pearls, laces and ribbons. 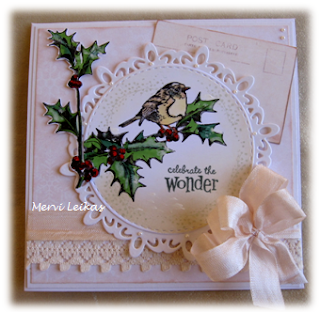 Little "dots" around the image is made with ramdom stamping with PB:s "Wonder Collection's wreath". On the second card I used it on the light patterned paper too. A gr eat choice of colours Mervi, gives a real Vintage feel with the postcard and shabby ribbons. They are both amazing Mervi. Love the stamp! Classy cards, love the images. two beautiful cards mervi! you've showcased the image so beautifully and i especially love the bow on the first one! Thanks so much for joining us at RRR! Hope to see you again soon. Beautiful card! Thanks so much for joining us at Papertake Weekly! Beautiful image and card. Thank you for sharing with us at Ruby's Rainbow Challenge. Two great cards with one stamp. Love the layout with the postcard. Beautiful card - I love the image and your card design. Thank you for joining us at Winter Wonderland. Absolutely gorgeous, Mervi - very elegant.